Joana is at present five years old. She is doing well and in good health. Joana attends the kindergarten from morning till midday. She is learning slowly the letters and numbers, being this way prepared to start school next year. Joana and the other children play using the very few toys or dolls the kindergarten has got. Joena loves to play with dolls. Her favorite color is red and her future dream is to be a police in order to protect all people from harm. 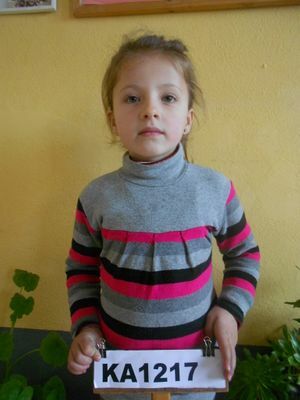 Joana’s mother takes her from the kindergarten and brings her to attend our feeding programme. She started to attend the programme at Katjel every Tuesday and Friday and enjoys the combined meals cooked and served to the participating children. She likes the fried chicken, sausages, pasta and rice served by our cooks. Joana attends the Bible classes for the children who are same age with her and enjoys singing to praise the Lord Jesus and learning from God’s Word through the Bible stories. At the end of the Bible lesson, she and the other children spend time to play at our feeding centre under the care of our teachers. A free dental care will be offered to her once a year by our dentist. Joana has her father, mother and a younger sister. She is two years old and her name is Xhulia. Xhoana’s parents own land and are able to plant wheat or vegetables for consumption. What comes out from the land is too less and the family is unable to provide all the food needed for the whole year through. There is a closed chrome mine in Katjel and the father works illegally there collecting chrome and selling it to the people who come to collect this mineral. The father cant’ still support all the expenses needed to fully provide the family with food and clothes and the four of them are still living in poverty. Joana’s mother does the housekeeping and cares for her small children while they are at home.